How long have you been playing Pokémon/Pixelmon? :Played Pokémon since Heart Gold and pixelmon for 4 years. Do you play Pokémon/Pixelmon competitively? :Not really. How long can you play per day? :4-6 hours on weekends. Why should we pick you? :I want to learn better at playing competitive and being a gym leader is going to be my first step. Hey, I dont really think that team makes a whole lot of sense moves/item wise. I strongly suggest taking a look at actual competitive movesets over here. Also just like your previous app as suggested by me and others maybe take some time to learn about the physical/special split here. Quick edit: evasion enhancing moves are not allowed for gym battles. So the very least Clefable has to loose the minimize. Thanks Kush, Ireplaced the Minimize with Calm mind. Hi, just changing out the illegal move does little to make your team work, I strongly suggest maybe reading up on each analysis of your Pokemon and finding out what might best suit them as far as moveset/what they bring to the team. 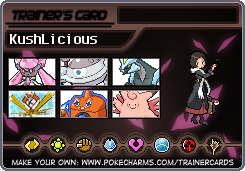 In order: Diancie, Clefable, Mimikyu, Mew, Tapu Bulu and Magearna. I dont really think its a bad choice of pokemon by any means I do think however in its current state its only a fraction of the potential it has. A personal note tho I would much rather use Lele if I was using any Tapu, psychic terrain does too much for your team to pass up on it.